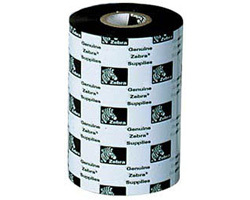 Zebra 3200 G Series Premium Wax/Ribbon for Desktop Printers (4.33 Inch x 243 ft; 12 Rolls/Case). UL / cUL / CSA Certifications with Zebra's Z-Supreme 3000t, Z-Extreme 2000T and 4000 Labels. A High Performance Wax/resin ribbon that provides outstanding barcode print quality and good resistance to scratches, smears and moderate chemicals.